Written and directed by Light Chaser founder Gary Wang, the film takes its inspiration from the?decorative home ornaments?that many Asian cultures believe will protect their households from misfortune. In?Little Door Gods,two Door Gods in modern-day China face unemployment in the spirit world, as few people believe in their spiritual powers anymore, and one of the gods decides to venture into the human world to create trouble in order to prove his value. The Assets Supervisor is responsible for leading a the modeling/texture/look dev crew. Ensures the technical and creative success of modeling and surfacing in the animation film production. The Assets Supervisor should mentor, guide and support the artists and to be able to effectively supervise the modeling and surfacing team meets production deadlines. Solves technical production issues, defines workflows, and develops tools/frameworks for all assets in a feature animation film. ·Supervise the Assets team by developing looks and giving direction, May required to do hands on development and/or modeling or look dev work. The Effects Supervisor is responsible for leading a team of Effects Artists in the creation and execution of shot work on a production. ?The Effects Supervisor identifying all effects in a sequence and clarifying with the Director, VFX Supervisor, and Art Dept. The Effects Supervisor should mentor, guide and support the artists and to be able to effectively supervise the Effects team technically and artistically. ·???????? Supervise the Effects team by developing looks and giving direction, required to do hands on development and/or shot work. ·???????? Understand the Directors’ vision for a film.? Chinese web entrepreneur Gary Wang says though he’s always admired Pixar, he wants to improve upon the Hollywood animation studio’s model. On its two-year anniversary,?Beijing-based Light Chaser Animation Studios released the first trailer of Little Door Gods, its first feature-length family entertainment animated movie. Light Chaser Animation aims to make feature films to rival those of Hollywood studios Pixar and Dreamworks. A familiar issue for many businesses these days is a scarcity of top talent. Chinese film studio Light Chaser Animation has taken an unusual approach to help to solve this problem – it bought a robot. The device is a “telepresence robot”, which it acquired from California-based Double Robotics. It consists of a battery-powered mobile platform to which an iPad is attached. The wi-fi controlled device can move around the company’s offices and it allows animation director Colin Brady – who lives in Los Angeles and did not want to move to China – to communicate with the rest of the team in Beijing. A year-old Chinese animated-film studio has hired former employees of U.S. powerhouses such as Pixar,while raising $20 million in the latest round of venture-capital funding. 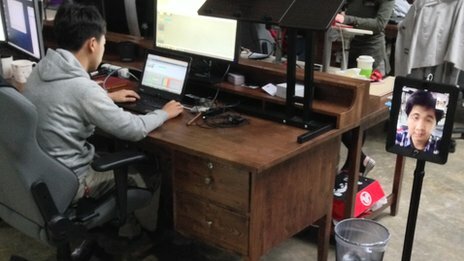 Light Chaser Animation Studios in Beijing now employs about 130 people — including some Westerners as well as over 20 Chinese “returnees”who have worked overseas in U.S. and French animated film industries.The studio plans to increase its staff to 160 by August,according to founder Gary Wang,a Chinese Internet entrepreneur who previously co-founded online video site Tudou in 2005. China’s Light Chaser Animation Studios has closed a $20 million round of Series B funding, led by GGV Capital and Chengwei Capital. “Little Yeyos” is the first short film from Light Chaser Animation Studios, a start-up animation studios based in Beijing. Light Chaser Animation Studios?was founded in 2013 by Gary Wang, the founder and ex-CEO of Tudou.com, China’s leading video sharing website. Our goal is to produce top quality animated films. Our mission is to combine technology and art to create unprecedented pieces of work. - Best talents inspire each other: Light Chaser brings together the best talents from different fields. With highest level of integrity, we express openly, communicate thoroughly, and pursue perfection. - Shared responsibility, shared success: Light Chaser belongs to each of its members. We share the responsibility of our mission as well as the fruits of success. - Innovation comes from curiosity and fun: Light Chaser is filled with curiosity about the world. Our fun work environment inspires us in creating the best works and products. - Equal emphasis on art and technology: Every work and product from Light Chaser pursues the perfect fusion of technology and art.